People in Egypt, in case you haven't heard, aren't too happy with the state of things under President Mohamed Morsi. Cairo has been beset with protests and riots since Sunday. But things got weird last night. 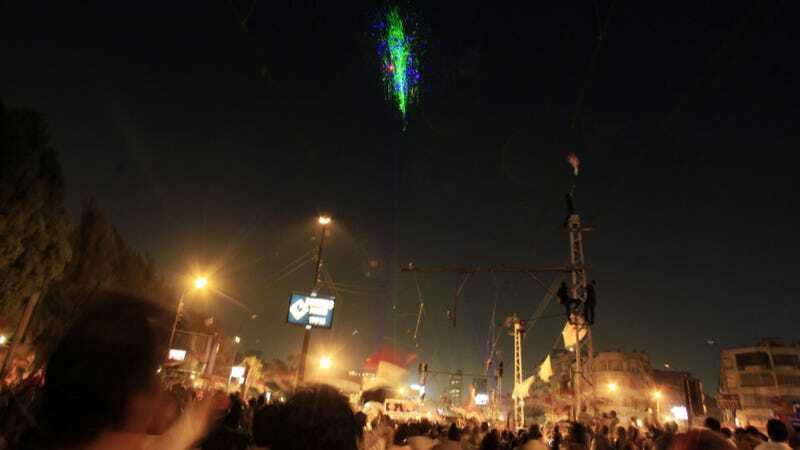 From this video, posted over at The Aviationist, we can see hundreds of laser pointers being shined on helicopters and other military aircraft hovering over their protest site. As many of you know, you're not supposed to do that because the light is absolutely blinding to pilots. It's illegal in the U.S. and has netted some steep punishments for perpetrators due to how dangerous it is. Of course, the protestors have a relationship with the military that's sometimes hard to comprehend. While the military regime was repressive under the Hosni Mubarak administration, many see the military as a separate and almost co-equal branch that can check the excesses of the current Morsi government. The military just gave Morsi a 48-hour ultimatum to shape up or they will intervene. I can't imagine what that must have looked like from the cockpit. Unless those pilots were properly protected from the light, it probably wasn't a pretty sight.